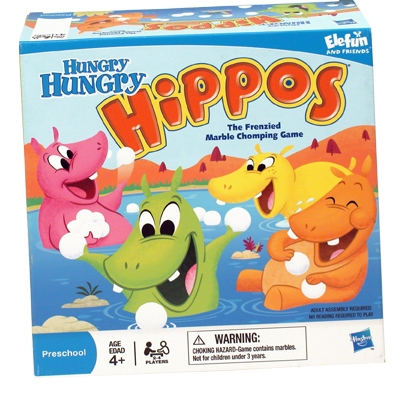 Do you have the hungriest hippo? Come on down to the riverbank and join Sweetie Potamus, Veggie Potamus, Picky Potamus, and Bottomless Potamus for a gobblin' good time! Will your hippo eat the most marbles to win you the game? Get ready for the fun and frantic game that leaves everyone hungry for more! The frenzied, marble-chomping game! Includes game base, 4 hippo heads, 4 hippo bodies, 4 marble launchers and guides, 20 plastic marbles and instructions. For 2-4 players. Ages 4 and up.